HONEYBEE seems much older than 6, she has a hernia and masses and she is terrified. She has RESCUE that wants to help but they need a local foster! Please SHARE, a FOSTER would save her sweet life. The cruelty never stops and HONEYBEE its ugly truth - she was so depressed that she could not hold up her own weight, having periods of weakness and falling onto her hind end. But, she is such a sweetheart, walking carefully on leash, posing for photos, not minding being tethered, and taking treats so gently as hungry as she must be. #A5206193 My name is HONEYBEE and I'm an approximately 6 year old female Chihuahua. I am not yet spayed. I have been at the Carson Animal Care Center since 8/1. I will be available on 8/5. You can visit me at my temporary home at C408. 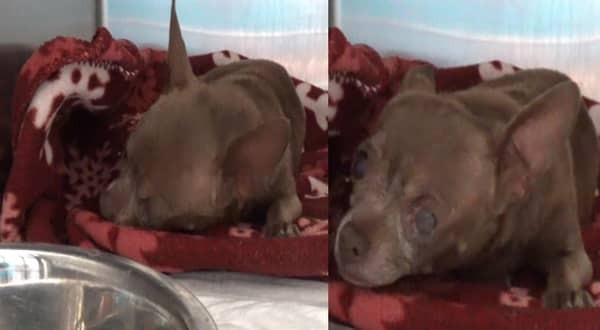 2 Responses to "Old and 'ugly' Chihuahua has given up, hopeless as nobody saw her as worthy of saving"
HONEY BEE RESCUED BY LEAVE NO PAWS BEHIND, INC. Thank you so much for saving her.